Import contacts and send email invitations or SMS invitations via CheckMarket. By doing so, you can follow up in real-time who has already responded and who hasn’t. You can also send automatic reminders. Include additional metadata such company, client ID, business segment, department, etc. There are three ways to import contacts into the CheckMarket online survey tool: via the API, via an FTP upload or manually in the tool. This article fully explains the manual import. For more information regarding the FTP upload, please contact our Development Team. For more information on the import via our API option, please see our API documentation or contact our API Team. If these options aren’t available yet, first click on Add/Remove Channel and activate the correct channel(s). If there are already contacts present in the survey, click on the blue + in the top left corner and select Import from a file. You’ll be guided through 5 steps. Click on each title below to see the details per import step. Click on Select to select a file on your computer, or simply drag and drop the file here. Please see to it that your list with contacts is a .csv or .xlsx file. Select the Worksheet that contains your contacts. If this is your first import you won’t have any configurations yet. Using the drop-down menu above each column, select which information you want to import. When you don’t select a field name, that column won’t be imported. Think carefully about which values you wish to place in which fields. Use custom fields to include important metadata so you are able to filter/sort on this data when downloading or analyzing the results. Select the row number you want to start the import from. Our system automatically detects headers and will exclude these from the import. 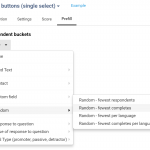 Depending on the status of your survey and also whether you’ve already imported contacts into it before, you may see different options in this step. We will discuss them all here. If the list contains people with no email address and you want to import these as well, e.g. when you are carrying out a paper survey, wish to invite people via text message or you want to download sign in codes, select Yes here. If your list has both contacts with an email address and contacts with no email address, both will be imported at the same time. This option is only visible if you have added more than 1 language to your survey. If you did not specify a language for your contacts or you don’t know their language, select a default language here. Any contact you didn’t identify a language code for in the Excel file will be imported with this default language code. What should happen when there are contacts already in the survey with the same email address as in the import file? Update the existing contacts and add the rest as new contacts: all contacts for whom the email address already exists in this particular survey, will be updated. Email addresses that don’t exist in this survey yet will be added as a new contact. Don’t update existing contacts, leave them alone and create new contacts for everyone in this file: every email address will be treated as an entirely new contact, even if the email address already exists in the survey. Using this option you can invite the same person more than once for the same survey. As soon as you select this option an additional option will appear: If the same email addresse exists more than once in this file, only import the first one. Leave this option ticked if you wish to deduplicate your file. If you do want to add certain add certain addresses more than once via the same file, untick this option. When would you like to send the invitations? If you wish to delay sending the invitations after you launch the survey you can add that here. Select Immediately if you want the survey invitations to go out immediately after you launch the survey. By selecting any of the other options the system will wait for the selected amount of hours or days before sending out the invitations to these contacts. After how many days would you like the survey invitations to expire? Here you can select how much time you wish to give the contacts to fill out the survey, even when it remains live for a longer period of time. 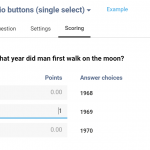 This option comes in handy when you have long-running surveys, yet you wish to limit the amount of time someone gets to provide their answers. Don’t import contacts that have been invited in the last … days: if this email address was already invited for a survey in your account – either for this particular survey or for another one in your account – in the specified timeframe, it won’t be imported into this survey. Don’t import contacts that have responded in the last … days: if a contact with the same email address has already responded to another survey in your account in the specified timeframe, it won’t be imported for this particular survey. For both types of cooldown rules, you can also choose whether to check only the survey you are importing the contacts into, or all surveys in your account. 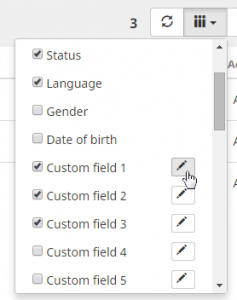 The custom fields in the survey will be renamed to match the column headers in your file, unless this was already done during a prior import. You can still edit them in this screen, or rename the custom fields later. When you’ve selected all additional options, click on Continue. You can save all selected settings in the previous steps into an import configuration. This configuration can be re-used later so you can import similar contact lists even faster. An import configuration contains all the settings and selections you made during an earlier import. This includes the column mappings, target group, target survey, invitation and expiration dates, etc. After selecting the desired configuration in step 2. Fields you can still make changes as you pass through each step. Afterwards you can update the existing configuration or save it as a new one. If you import the same kind of list regularly, we recommend saving it as an import configuration. It really saves a lot of time. If you are doing a one-time import, there is no need to save your configuration, and you can simply skip this step. Give the import configuration a name and click on Continue. In this last step you get an overview of all the settings you determined for these contacts. You can still go back and make changes if necessary. If all is ok, click on Start import to import your contacts. Once the import is complete, you will receive a confirmation email. In the meantime you can continue working in the tool. 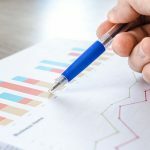 It’s important to include all extra information that you want to use in your survey reporting, such as customer id, segment, etc.. Use this data to show different questions and to segment your results.